11 years ago an acquaintance called and asked me to take in a kitten with a horrible beginning. 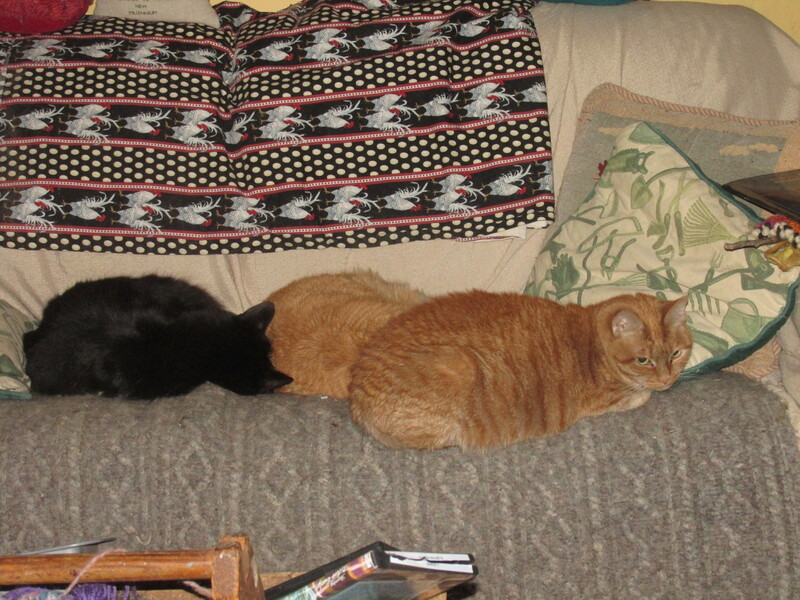 At that time I had many cats and thought nothing of taking in another. I knew it came from a feral family but thought for sure that she would adjust. 11 years later and I have only touched her about 4 times and can never catch her. She had got very ill. For weeks I tried every way I could think of to catch her. Finally the vet gave me a name of a cat catcher (i have to say that I am a little upset with the vet as I have been trying off an on to catch the cat for a few years and they knew it.) She has always been a tiny cat looking more like a kitten than an adult car. She has enjoyed the company of many cats and has made friends and has been loved by them and me. . Her name was Marion but I called her Baby. She would watch me from the end of the bed but can never got over being feral. I accepted her as she was, she could never change. here at the farm. She was always in view or with the other cats. We will all miss her. I am happiest when the barn is full of hay the pantry is full of cat food and litter and chicken food is in good supply. My animals come first . Haying has started here last weekend. I have two books on my bed stand at this time. CROW PLANET BY Lyanda Lynn Haupt and AMERICAN WOVEN COVERLETS by Carol Stricker. Two wonderful books and so different. Crow Planet takes one into the realm of crows. An interesting and mysterious bird. Lyanda entwines the lessons about crows with the what is happening to our environment. She takes us deep into the lives of crows their behaviors and quirkiness. I am really enjoying this book. American Woven Coverlets is a book that I have had since the late 80’s when I was learning to weave at Hill Institute. I want to delve into it more now that I am going to weave again. Carol takes one into all things about coverlets. From why and how they were made to drafts and pictures. An interesting book for the person who loves coverlets and for the weaver who wants to learn more. So sorry to hear that Baby didn’t make it….but you are right, she is running pain free now and had 11 safe years with you…. Thanks so much for your kind words, Got a show this weekend will call you next week.